how gorgeous are these snakes. beautiful. 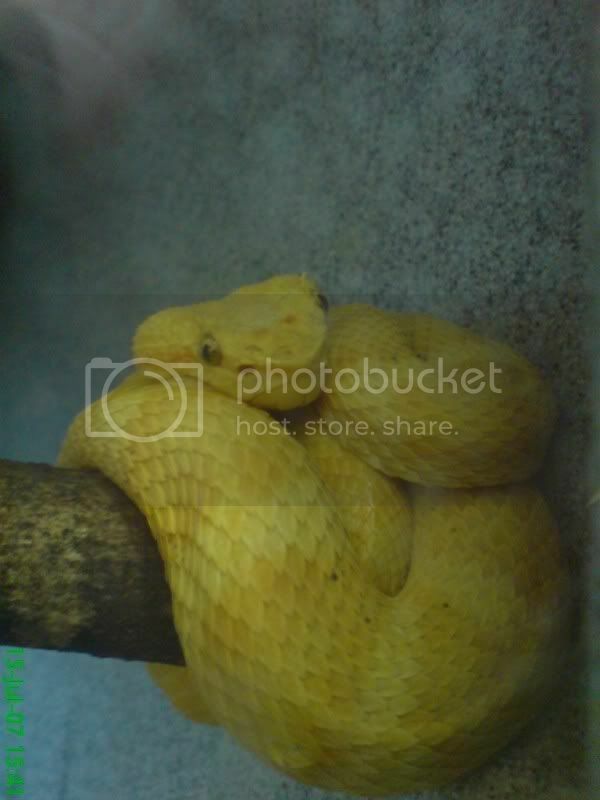 some great pics and they look stunning snakes!! just a couple of reptiles! to keep me out of trouble! i remember when they were tiny! and on pinky heads!, what they on now? great little fellas. Momma is stunning 2 heres a pic of her. God I cant wait till I can get a DWA. Gila's and them me thinks. another of the mum. Really nice temperament. absolutely stunning and some great photos id like to see these in the flesh. I have been off line for a few days, just got back on this morning and seen these beauties. I have a pair of youngsters that I got off Shropsire Exotics, and they are stunning. They were about 8 inches long when I got them, I have had them for about 5 months, and they are about 12 inches long now. They are great eaters, taking two large pinkies about every ten days. I would say they tend to strike more readily than most Trimeresurus, but they are not that bad. They do have a very long strike though, like most arboreal vipers. I will try and post some pics.